A weird and wonderful proto-socialist, proto-surrealist, anti-civ utopian vision for the world. Read Christopher Prendergast's review of Fourier, Omnigamy in Fourier's Utopia, here on LibCom. This Remarkable book, written soon after the French revolution, has traditionally been considered one of the founding documents of socialism. It introduces the best-known and most extraordinary utopia written in the last two centuries. 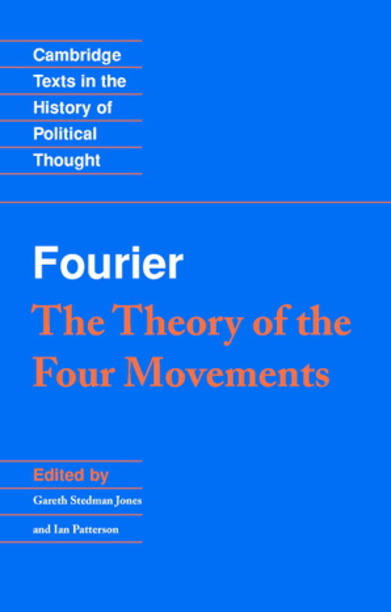 Charles Fourier was among the first to formulate a right to a minimum standard of life. His radical approach involved a systematic critique of work, marriage and patriarchy, together with a right to a 'sexual minimum'. He also proposeda a comprehensive alternative to the Christian religion. Finally, through the medium of a bizarre and extraordinary cosmology, Fourier argued that the poor state of the planet is the result of the evil practices of civilization. "Since the Philosophers demonstrated their ineptitude in their attempt to put their ideas into practice in the French Revolution, everybody has agreed in regarding their science as an aberration of the human mind, and their floods of political and moral enlightenment as no more than floods of illusion. How else, after all, can we view the writings of these scholars who, having taken twenty-five centuries to perfect their theories and having brought together the whole of ancient and modem wisdom, begin by creating as many calamities as they promised benefits, and lead civilised society back towards a state of barbarism?" "It is amusing that civilised man, who boasts of the superiority of his reason over women's, should require girls of sixteen to behave with a degree of rationality they do not themselves acquire until they are thirty or forty and have wallowed in debauchery since their youth." "To be frank: fathers of marriageable daughters play an objectionable role in civilisation. I suppose that paternal love is capable of rendering them blind to the disgraceful nature of the methods and cajoleries they adopt in order to lure suitors, but they can hardly be blind to the uneasiness and disquiet that attaches to such a role"
"This is where they [the philosophers] revealed their real mediocrity, for the human mind has never created anything more mediocre than the two religions philosophy gave birth to at the end of the eighteenth century, the Cult of Reason and Theophilanthropy. These were truly pitiable religions, dead before they were even born. [.....] Both religions committed an entirely new blunder in having no priests: the people want to see men entrusted with the proxy powers of God. But the theophilanthropists frequently chose a lawyer or a merchant to proclaim the word of God, and nobody likes to see men like that preaching virtue." "I shall now explain the relation of the insular monopoly to God's designs. It may be predicted that the views of the Creator on this point will not be in agreement with the opinions of civilised men who, in matters of politics, have always vegetated, scarcely raising themselves from insignificance to mediocrity. They might as well have stayed at the bottom of the ladder as drag themselves one rung above it."